DjVu (pronounced déja vu) is a file format originally developed by LizardTech and AT&T primarily to store scanned documents, especially those containing a combination of text, line drawings, and photographs. While in certain situations the size of a DjVu document is smaller than that of a PDF file (having the same contents), its main disadvantage is the low user base. PDF on the other hand is so popular that most computers now have a PDF reader installed, thus if you need to share your content with others, PDF is the choice over DjVu. The default DjVu viewer won't allow converting to the PDF format, thus a third party program (virtual PDF printer) has to be installed in order to do the conversion. novaPDF can easily convert DjVu files to PDF documents – once installed, simply press the Print button, choose novaPDF as the printer and your DjVu document will be converted to a PDF. 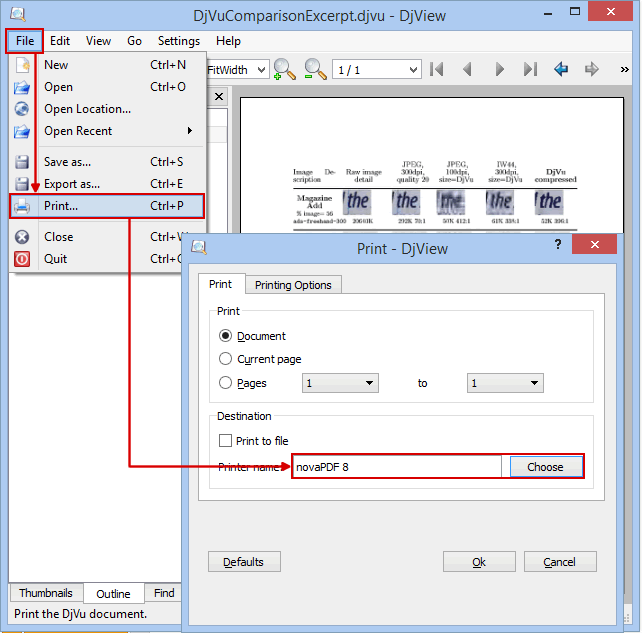 From the Printer section select novaPDF and click on OK. You'll be asked to choose a location and the PDF will be generated and saved once you click OK.
WinDjView and Djview are two open source readers for the DjVu file format. Download WinDjView from http://windjview.sourceforge.net/ and novaPDF from Download and install them both on your computer. Go to File->Open (or press Ctrl+O), browse for the DjVu file you want to convert to PDF select it and click Open. Go to File->Print (or press Ctrl+P) and from the Printer section choose novaPDF. 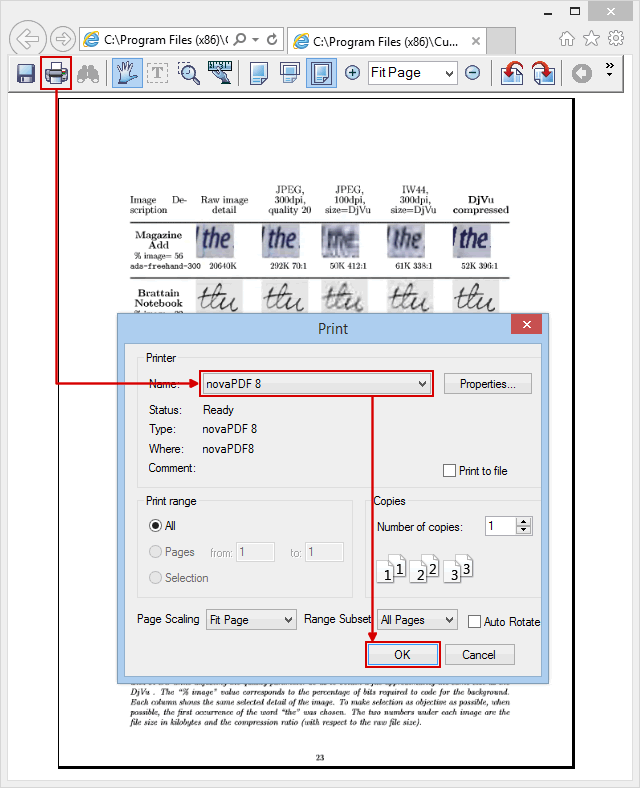 Before creating the PDF file you can customize novaPDF's settings by using the Properties button and also adjust other printing options. Click on Print and choose a location where you want the PDF document saved. Download **DjVuLibre from http://sourceforge.net/projects/djvu/files/DjVuLibre_Windows/ and novaPDF** from Download and install both applications on your computer. Go to File->Open (or press Ctrl+O), browse for the DjVu file you want converted to PDF select it and click Open. Go to File->Print (or press Ctrl+P) and uncheck the option Print to file. This will allow you to select a printer so click on Choose and pick novaPDF. In the Printing Options section you can customize the color, orientation and the scaling of the document. Click OK and choose a location where you want the PDF file saved. Both the DjVu and PDF formats define features that aim at creating a document delivery platform. The main difference between the DjVu and PDF is that DjVu is developed as raster image format, while PDF is developed as a vector image format. A consequence of this difference is that when a DjVu file is created, a maximal raster image resolution must be specified, while the PDF vector image resolution can be magnified at arbitrary values without loss of data. This means the quality of images in a DjVu document is lower than in a high resolution PDF file. Good compression – the file can include a great amount of elements (graphics, colors, fonts, patterns) and still have a small size (but with a cost, as there is a loss of quality in converted images ). Suitable for Electronic books – DjVu documents are viewed in a manner that is more user-friendly for people accustomed to reading eBooks. Fast image rendering – when viewing the DjVu document, pages with images will open very fast because graphics are rendered in advance (cached). Scanned documents conversion algorithm - for its main purpose, DjVu has a unique algorithm for converting scanned image and text elements. DjVu is good as an archiving format for documents with graphics, manuals and scanned documents (as long as quality loss is not an issue). Image quality loss may occur when converting to DjVu from other formats. Restricted usage – DjVu requires a license for commercial distribution so it has a very low user base in comparison with formats such as PDF. Dependable - separate programs or plug-ins need to be installed for creating or reading the file. Popularity – PDF is the most popular document format for sharing and storage, and a wide range of software solutions are available (free and commercial). Security – It has the best security settings for keeping the document safe from unauthorized access. 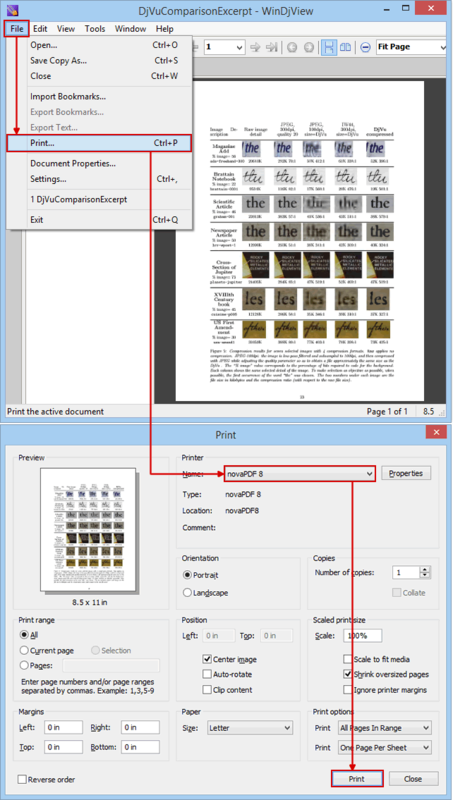 Fidelity – the PDF conversion algorithm offers an optimum quality/size ratio, as it significantly compresses data (especially text) but without quality losses. This is why PDF is widespread in the printing industry too, as it can produce press-quality documents that render content exactly as when printed on paper too. Dependence - requires installing separate programs for reading or creating the document. Manageability – by its nature PDF is not meant to be an editable format as it is simply described as an image of a document. Software that can edit PDF files does exist (an example would be Adobe Acrobat) but is expensive to purchase. Compatibility – the PDF format complies with font licensing so commercial fonts will not be embedded in PDF documents and will look differently when the PDF is opened by other people. Taking into consideration the specific features of each format as well as its advantages, DjVu and PDF cannot be considered rival formats as they are designed for solving different tasks and therefore complementing each other.